The Odikro of Wassa Abreshia in the Wassa Akropong area of the Western North region, Nana Amoah Bediako II, popularly known as Nana Kwasi Kumi, has allegedly slapped a policeman for being asked to park well at the station. Inspector Tetteh Agbanyo, who is the station officer at the district, approached Nana Bediako II on Friday, March 22, 2019 at the station in the morning to ask him to move his car from an unauthorized spot to avoid obstruction. According to a police report, the chief felt offended by the instruction and slapped the law enforcement agent. “The Station Officer told him to move the car and park at a right place to enable others to have easy access to the charge office. He [then] became offended and slapped the station officer,” the report sighted by Daily Mail GH recounted. The police report also revealed that a police officer who is a native of Wassa Akropong Detective Inspector Alex Donkor and an unnamed civilian prevented the arrest of the sub-chief, who escaped eventually. Hours later the local chief, the report said, returned with five heavily built men to cause more havoc and assaulted the station officer. 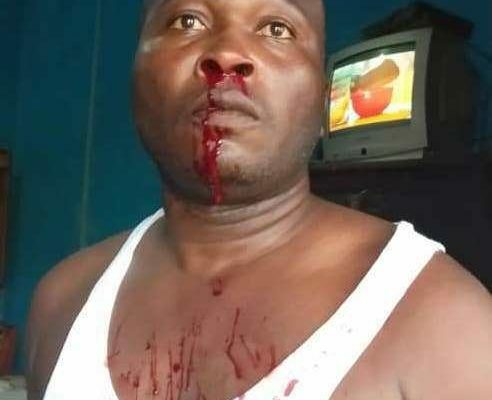 “At about 5:00 pm same day, the suspect, Nana Amoah Bediako stormed the Police Station with five macho men and attacked duty men, and again attacked and punched the station officer on his nose which made him bled profusely. He threatened him with words to wit ‘l will kill u’,” the station report said. Nana Bediako II has since been arrested and transferred to the Divisional headquarters for investigation.